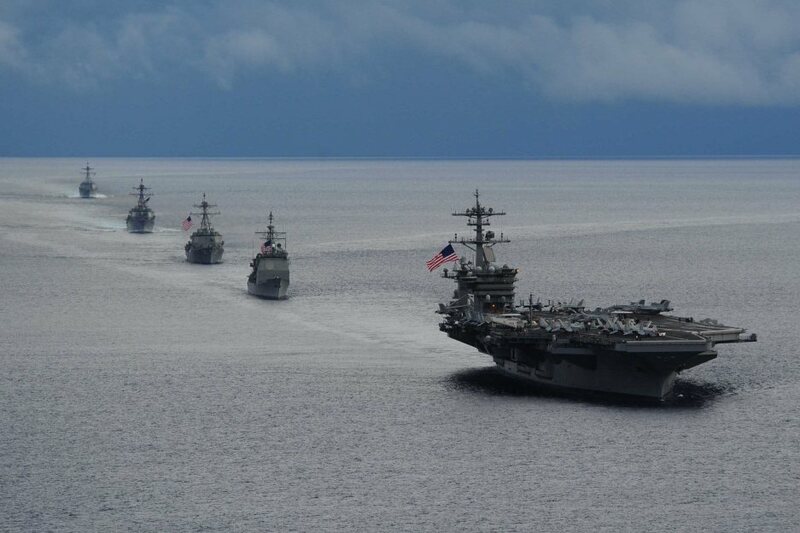 The US President Donald Trump’s fateful decision on a military strike against Syria is imminent and it will impact not only Syria’s future and Middle Eastern politics but also the US’ capacity to impose its global hegemony in the emergent world order. Trump claims he’s about to order the attack. But it is also a Trumpean message. The second part is addressed to the Kremlin and speaks about potential US-Russia cooperation to mutual benefit. 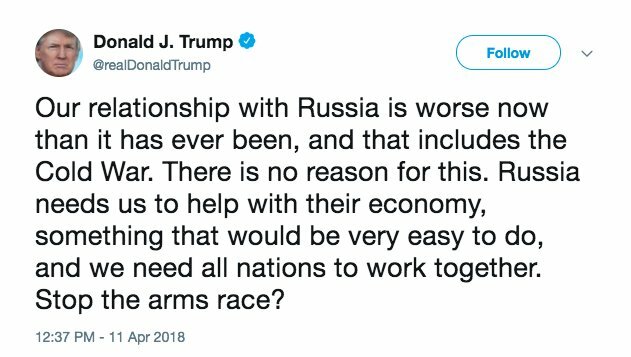 Trump offers the bait of negotiations on curbing arms race, which is a priority issue for Russia. 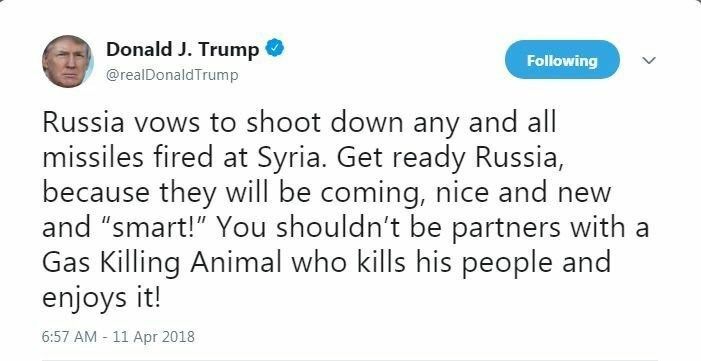 Trump apparently thinks he’s ‘negotiating’ a ‘win-win’ solution by dangling a carrot and expecting Moscow to stand aside and letting the US attack on Syria go ahead. It’s tragi-comic, to say the least, that US diplomacy has come to such a pass – POTUS negotiating Syria as if it’s a property deal in Manhattan. A flood of Russian statements, on the other hand, underscore that Moscow will defend Syria no matter what it takes. Which means not only that the US missiles will be shot down but also that American launch pads will be targeted. This latter message has been conveyed through the Hezbollah TV channel, which is of course a devastating snub to Israel. Following the Israeli attack on the T4 air base in Syria on Monday, Putin deputed his special envoy on Syria Alexander Lavrentiev to go to Tehran on an ‘unscheduled and unexpected’ visit to meet Iran’s powerful national security czar and point person on Syria, Rear Admiral Ali Shamkhani, who is the executive head of the national security council and reports directly to Supreme Leader Ali Khamenei. Evidently, Russian-Iranian coordination is at a very high level. As for Iran, it is playing its cards close to the chest, which is as it should be. Tehran understands perfectly well that the false flag operation alleging chemical attack may be used as alibi by the US to create new facts on the ground in Syria aimed at eroding the commanding position that Russia and Iran enjoy. The state of world affairs invokes nothing but concerns, the situation in the world is becoming more chaotic. Nevertheless, we still hope that common sense will eventually prevail and international relations will enter a constructive course, the entire world system will become more stable and predictable. In reality, Trump finds himself in an unenviable situation. Russia has made it abundantly clear that it will counter any US attack on Syria and, God forbid, if there is any loss of Russian lives in the American attack, all hell will break loose. On the other hand, if Trump backtracks, it will dent his credibility. This is not like calling Kim Jong Un a “Little Rocket Man” and getting away with it. Is there an exit door available for Trump? Yes, there is. The US Defence Secretary James Mattis said today that the work to assess the intelligence on the alleged use of chemical weapons in Syria’s Douma is still in progress. To quote him, “We’re still assessing the intelligence – ourselves and our allies. We’re still working on this.” Mattis said this when asked pointedly whether there is sufficient evidence to accuse the Syrian government of using chemical agents in Douma. Indeed, if the Russian general’s assessment of a false flag operation is upheld, Trump might heave a sigh of relief. After all, if there was no chemical attack, why should there be retribution? Trump is simply the BEST PRESIDENT elected till now! He exposes what the American Elites and vast majority of the population really are. It’s a unique opportunity to the rest of the world populations to detach themselves from this negative and unbalanced people.